An announcement before answering is played for an external caller, that called a user object in the PBX. The announcement can be played parallel to ringing at the users phone and begins after a configurable period of time. V7 HF6 PBX and later. 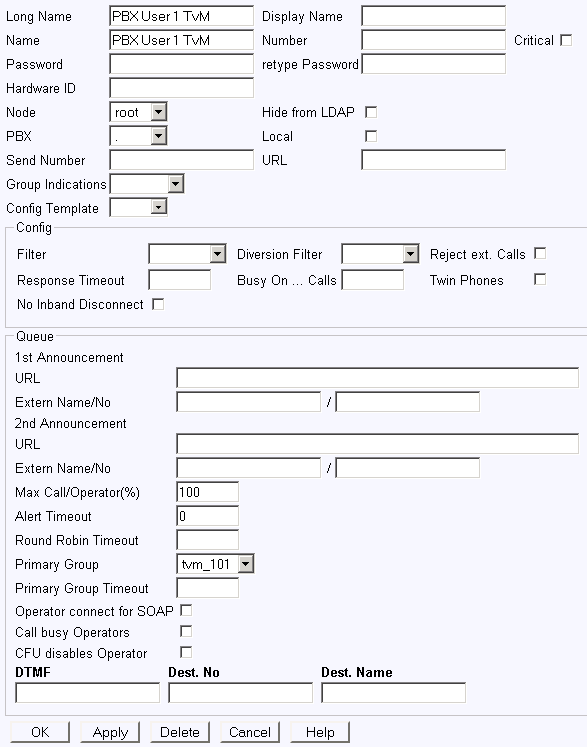 An announcement before answering configuration is based on the Waiting Queue PBX object. The Waiting Queue has a personal announcement configured separately for each PBX User object. We assume an existing PBX user with the name "PBX User 1" and number 101 with following desired behaviour: an external call to this user is always immediately connected to the announcement. No announcement if the user is busy, just send cause code busy to the caller. Create a group on the user object. This group will be used only for this PBX user and this feature, so choose appropriate name e.g. "tvm_101". Do not set the "active" flag on the user objects group. Create a Waiting Queue "PBX User 1 TvM". Configure the first and second announcement URL as usual (check Waiting Queue Reference for more information). Set "Max Call/Operator(%)" to 100 and "Alert Timeout" to 0. Configure the "Primary Group" as "tvm_101". To be able to do this, add first the WQ object as active member to this group. Create a so-called administrative call forward on the User object: create a CFU with "Only Ext." to the name of WQ object. This CFs are not deleted by user configured CFs via a phone function key etc., but are just overridden by user configured CFUs. A CFB configured by the user is overridden by the administrative CFU to the WQ. It is not possible to configure a CFB or CFNR on the WQ back to the user, it will create a CF-loop and will be not executed(the call remains at the WQ). As workaround define the number for CFB or CFNR directly on the WQ and not on the user object. The user can only activate/deactivate this CFB or CFNR on their phone using a Boolean function key. If announcement before answering is used, it is also possible to define a DTMF Map to the desired CFB or CFNR target on the WQ and provide the info about it to the caller (e.g. "Please wait or press 1 for operator."). This page was last modified 18:51, 11 November 2015.